In case you haven't noticed, there is a writer's game of tag going on, in which we writers answer four questions related to our writing process and current work. Today I'm It. I have been tagged by my good friend, fellow Ladies Killing Circle member, and fellow Ottawa writer Mary Jane Maffini, who is the prolific author of four wonderfully funny mystery series, including most recently the Book Collectors series which she writes with her daughter under the name Victoria Abbott. In turn, I am tagging my friend and Type M colleague, Charlotte Hinger, who will post her blog on Type M for Murder on August 11 at www.typem4murder.blogspot.com. Charlotte is a novelist and Kansas historian who has won awards for both fiction and non-fiction. Her first novel, Come Spring, won WWA’s Medicine Pipe Bearer’s Award. Hidden Heritage, the latest mystery in her Lottie Albright series was selected as one of the Best Mysteries of 2013 by Kirkus Reviews. Her academic article “The Campaign to Organize Graham County won the Westerners International award for best article. She lives in Loveland Colorado, but still claims she never left Kansas because Colorado was once part of Kansas Territory. 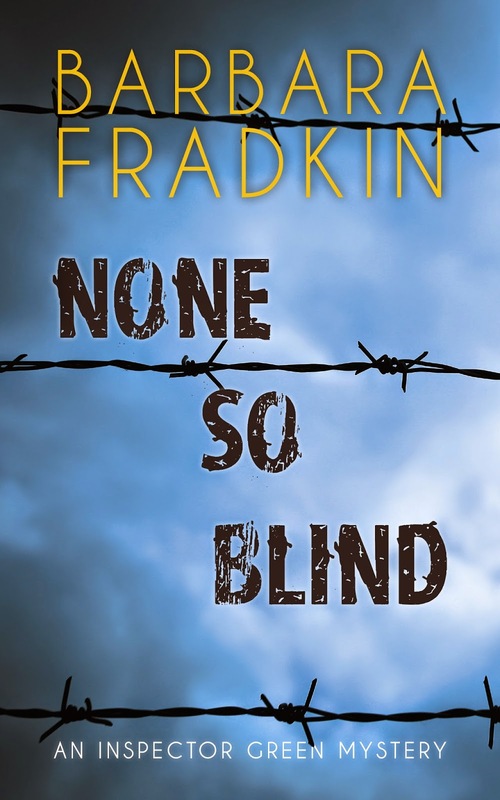 I am now about seventy five pages into the first draft of a brand new mystery series featuring a former international aid worker who is trying to find a new path after her last posting went seriously wrong. Each book will have a different setting, but this one is set on Newfoundland's Great Northern Peninsula, between Gros Morne National Park in the south and the wild northern tip where the Vikings first settled. The tentative title is FIRE IN THE STARS. Several ways. I explore the real Canadian landscape and include social and human issues grounded in those settings. My Inspector Green series, for example, is set primarily in Ottawa with forays into other very real Canadian cities like Halifax and Montreal. But I think my unique contribution is probably my focus on the human cost of crime and suffering. As a retired psychologist, I am interested in what drives ordinary people to desperate ends, and the effect their crime has not only on themselves but on others drawn into the vortex. How are villains made, and how are heroes? For me, writing is a form of catharsis, cheaper than therapy! It's a way to explore issues and people, to put all the complexity out on the page and muddle through what troubles me, hoping along the way to shed some light on the issues and create some compassion for the people caught up in it. Non-fiction can give us the facts - about PTSD, war crimes, sexual abuse, and other human struggles, but fiction goes deeper. It taps into emotional truth. If readers are touched by my books and take away from them a little more understanding and compassion, then I am happy. Willy nilly. I usually come up with a germ of an idea that I want to write about, and I start to research it, looking for a way in through the factual detail to a story. That idea is rather like the grain of sand in the oyster; I start to build and build around it; first of all in my imagination but as soon as I have a toehold, a couple of key characters, and a vague idea of some story twists, I begin my free-wheeling first draft. I don't know where it's going, who I'm going to meet along the way, and certainly not how it will all be resolved. Research and writing proceed in tandem as I look up what I need to along the way. Thank goodness for the internet. I also write my first draft longhand, curled up with a pen, a pad of paper, and a drink at my elbow. 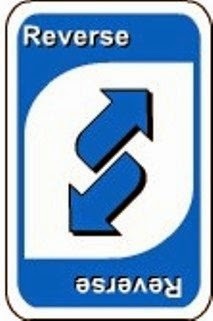 I've been doing that since I was 6 years old, and I don't think my writing muse would even visit if I were on the computer. The first draft ends up an unwieldy, at times disjointed and inconsistent mess, but that's what rewrites and re-rewrites are for. Sorry I’m a bit late today. I actually sat down to write my post this morning at 8:15 a.m. EDT and I’m just getting to it. Ah, the life of a freelancer! I’m not one of those people who’s on Facebook 24/7, but I do look at it once a day – mostly to keep track of friends having birthdays, and of course once a week to announce what I’m blogging about here on Type M.
To cut to the chase, I noticed this morning some snapshots taken by one of my oldest friends, Suzy Schrader, a person who sat next to me in our Kindergarden class photo. She and her husband were recently visiting Mamaroneck, NY, where we all grew up. (To be completely accurate, I lived there until I was nineteen and moved to Canada. I’ve never really grown up.) Of course they swung round to their old homesteads and snapped some photos. Suzy lived around the corner from us on Beach Avenue (Nowhere near the water, but it does have beech trees. I’ve always wondered if someone got the spelling wrong.) and her husband lived on Jefferson Avenue. And now we come to the point of this post. Looking at the photo of Mike’s house flooded my memory with details of my first “real” job: delivering the local paper. I started when I was 12 and did it until the end of school when I was 14. My paper route included the major part of Jefferson Avenue. I delivered The Daily Times six days a week, rain or shine – ice, fog and snow be damned! I was very conscientious about servicing my customers. But there were a few days here and there where I was too sick to carry out my task. My brother would usually fill in but on two occasions my dad had to do it. (I don’t know how much he minded. He’d had a paper route when he was a kid, and often spoke fondly of it when he’d occasionally drive me around on my Saturday delivery (very thick and heavy papers). It was a good father/son time for me.) Overall, my first job was a good one about which I have nice memories. I had beautiful suburban streets to walk, a couple of interesting dead ends by the river, and the New Haven railroad ran along one side of my route, just behind the houses, so I could see all sorts of trains zipping by. So with all these things floating around in my head, of course my thoughts eventually stopped with a jolt at the one bad memory of my time as a paper boy. Actually, it was a horrible time in my life and one from which I still bear some psychological scars. You see I had to deliver the paper the night my dad was the lead story on the front page, and not for a very good reason: his life had ended the night before in a car crash. It was the first time that I had to face death. That was a jolt in and of itself, but to lose one’s dad in such a manner was pretty horrible. One moment he was there and the next, gone forever. I won’t go into all the things that took place during that awful period, but it’s strange that one of my strongest memories about it, possibly the strongest one, is having to deliver those papers. I remember desperately not wanting to be seen by any of my customers. The last thing I wanted was for them to take the paper from me, read the headline, and then want to talk about it. 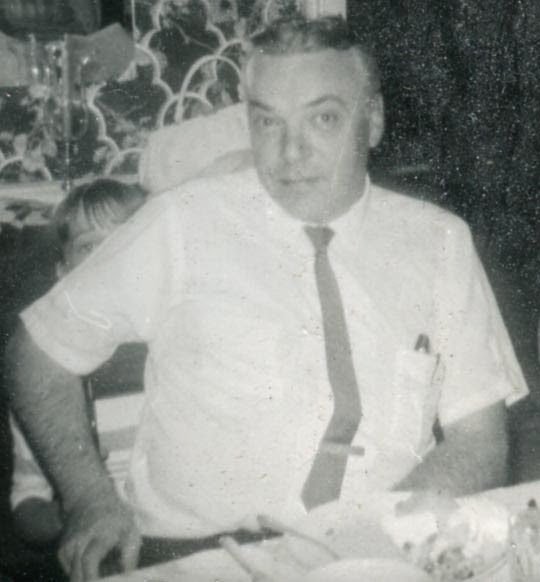 Everyone knew that Ed Blechta was my dad, and being the kind people they were, they would have wanted to offer me some comfort. I was just not ready to hear it, however. Another thing: being fourteen, I desperately didn’t want to cry in front of them. It’s a guy thing, and very strong around that period in a young man’s life. I also was having trouble accepting what had happened, and talking about it wouldn’t have helped – not during the first twenty-four hours. That day, I snuck onto people’s porches. If they had dogs that barked, I’d simply chuck the paper onto their porch and run (something I never did: papers were always folded and put into mailboxes or between storm doors). I hid behind trees if someone came to the door quickly. I wanted more than anything to be invisible. When I delivered my last paper to the Baviello’s house next to the bridge over the Mamaroneck River, I hightailed it for home. Folding my bundle buggy, I tucked it under my arm and ran the five blocks back to my house in what was certainly an undignified manner. Now, nearly fifty years later, that memory is one of the most clear that I have from my youth. It still runs in High Definition right through my head like my own personal Stand By Me. Ain’t it funny how things happen. Through my fifty year lens, I can so clearly recall one of the seminal experiences of my youth, a small matter really in the scheme of things, something no one shared with me, and about which I’ve really never spoken. As a writer, all I can think about is how to get across my plots this viscerally to my readers. I wish it was a tap I could turn on and off at need, but that ain’t the case. So today’s blog isn’t very much about writing, but it’s all about setting, emotion, and character. Some time ago, when I was Chair of the Society of Authors in Scotland, the new managing director of the chain book store Waterstones came to speak to our committee. We wanted to talk books; he wanted to talk commodities. I don’t think I was the only one who was struck dumb when he told us flatly that there was absolutely no difference between a book and a tin of baked beans; they were both just something to sell, preferably piled high and priced cheap. Successful selling was all about ‘the brand’. I’m happy to say he was wrong; Waterstones didn’t prosper under his direction and he has long since gone. James Daunt, who is in charge now, fortunately has an entirely different attitude and the bookshops are once again a pleasure to visit, a place where books have individual identities. But as authors we’re constantly being encouraged to develop ‘our brand.’ As part of ‘the package’ we must also develop ‘our voice’. One website I looked at recently suggested that to be successful you needed to work out precisely who your target audience was and aim your writing precisely at them. A helpful way to do it would be to read the advertisements for products that this audience might enjoy and imitate the style of the copywriters. It made me profoundly sad. Perhaps it works, but I’d hate to think so. I’d always naively thought that your individual ‘voice’ was something that came about as you grew into being a more confident writer, a projection of what you are, yourself. I like to think that when readers pick up one of my books that they can recognize that it’s me speaking to them, the way my friends recognize my voice on the phone without having to be told who it is. I can see that from the point of view of sales it’s good to make it easy for someone browsing to spot your books on a shelf but I reckon that’s more a question of consistency in book design – and I’m particularly lucky with my present publisher that they have developed a distinctive style – a ‘brand’ if you like – for my covers. (If you’re reading this, Susie, thank you!). I admit, too, that when I started writing I studied PD James because I thought maybe it would rub off on me so that I wrote like her – imitation genuinely here being the sincerest form of flattery! It didn’t, of course, but I’m glad about that. I’m me, and even if I’ll never be the writer she is, I’d hate to be successful because I was marketed under a ‘PD James’ brand – yes, just like a tin of baked beans, only with the supermarket label instead of Heinz. Once in while someone comes to me (usually after a signing) saying they have the most wonderful story. They know I will just love it. They have a proposal for me. They will give me their idea. (For free, yet.) Then I can write the story and we will split the money. At that point I usually have a brainstorm. Why don't I give them an idea and they can do the work and we'll split the money. Only you will have that essential emotional connection to your ideas. Your ideas will rarely stir another writer to actually sit down and produce some work. There are obvious contradictions to this, of course. Some work very effectively as collaborative writers. And one of the greatest husband and wife teams I know are Michael and Kathy Gear. But that is an entirely different process. A book is a difficult undertaking under the best of circumstances. It requires a tremendous investment of time and energy. The idea you have will be best written by you, because of the fire in your heart. The most common reason people don't proceed is they don't think they can. "I'm not a writer," they protest. "Really. I wouldn't know where to start." Do you think we Type M'ers know where to start, just because we are published authors? Actually, no. You would think, after all these years. . . but no! I have always believed that there are wonderful writers out there who will never experience the joy of seeing their work published because they could not stand to bat their way through the fog. Because when writing doesn't come easily, they think they have no "natural" talent. There have been several posts about ideas on Type M recently. I've never understood where ideas come from. I'm the happiest when I've made some progress on a book and instead of being bombarded by ideas for books, stories, sewing projects, computer workarounds, my mind switches to plot problems. Plotting might be harder, but it's more comfortable than the pre-book restlessness. One of my best short stories developed when someone asked me what I was getting my granddaughter for Christmas. I said "that depends on what the other grandmother is buying." Loved the phrase"the other grandmother." No, "the other mother" would be even better. I liked the way it rolled off my tongue. Such an unlikely source for a workable idea. The story morphed into "Any Old Mother," and was selected for the MWA anthology, Blood on Their Hands. Only a true Kansan will connect with the precipitating idea for my next mystery, Fractured Families. Anyone care to guess? If so, tell me on the comments screen. One of the best things about being a crime writer is that the "community" of crime writers you hear so much about really is just that. Case in point: I'm in Exeter, New Hampshire, where Dan Brown wrote many of his works, where there's a pretty well-known school (Phillips Exeter Academy), and where yours truly is in the midst of summer school — teaching crime fiction to 56, 8th- and 9th-grade students. Wednesday, I taught a wonderful story, “A Family Game”, by good friend Brendan DuBois, a novel and story writer whose short stories have won just about every major award a mystery story can win. After he spoke to my class, we went for coffee. Brendan shared some information that I will pass on here: Audible.com, utilizing an Amazon platform called www.acx.com, has a program where a writer can offer his or her backlist (titles to which one owns the rights). Narrators audition for the writer, and the royalty splits give the author 25%. With a growing backlist (five and counting), it seems like a no brainer to me, since one can earn roughly $5 on every sale. As Brendan did for me, and from one writer to another, I pass this information on to you. 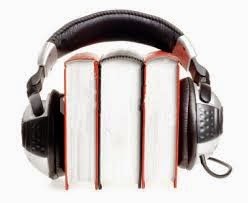 I’ll keep you posted as to how my Audible.com excursion goes. Okay, Type M fans, you’re going to have to do a little reading today before we being. Since you’re here, I’m going to assume that you have some interest in what writing is all about, in which case I’ve got something quite intriguing for you. I few weeks ago, I stumbled across an article about the results of German researchers investigating how the brains of writers actually work when they’re at work. Click on this to read it. I’ll just work a bit on my new novel while I’m waiting for you to read it. It’s nice to see that my experience has been now medically confirmed. I am not a flake and my brain appears to be working the way it should. There’s nothing wrong with my invisible friends carrying on discussions in my brain — even when I don’t ask them to. Case in point: last night, after a rehearsal of the big band in which I play, as we sat around in our host’s backyard (Thanks, Henry. It was a lovely evening! ), I dropped out of a conversation I was having with two people when I realized that two of my characters had started a discussion about why it’s important for people to make clear decisions about what they want to pursue in life based on what their interests are, not on parental expectations. The conversation might well never appear in the book, but it confirmed something I had been suspecting about both characters which they had previously only hinted at. Now they were saying it out loud. Whether the dialogue appears in the eventual book or not is immaterial. It tells me a lot about each characters’ motivations and I can move forward with that in mind. I’m not. I’m just wired that way! Barbara talked earlier about one of the joys of the writers’ life research and travel. Yesterday morning I finished the first draft of the new Sergeant Ray Robertson mystery, A Hill Full of the Dead. This is a Rapid Reads book for Orca Press, a follow up to Juba Good. Juba Good is about an RCMP officer serving with the UN in South Sudan, helping the new country create a modern police force, and I wrote it when I was visiting my daughter, a Canadian diplomat in that country. Orca liked Juba Good so much that they wanted another book in the series. But with the situation in South Sudan being so volatile at the moment, I felt that I really couldn’t set another book there. So, instead, I took Ray to Haiti. I have a friend who lives in Haiti and I was able to pay her a visit. She introduced me to a couple of RCMP officers who were working with the UN in Haiti, and they were able to tell me all about their jobs there. A perfect setting for Ray! You can’t fake having been to places such as Haiti or South Sudan. If you want any veracity at all, you have to go there. The air is different, the light is different, the sights and smells are different from what we are used to, and very different from what we imagine them to be. As an example, as soon as I saw the main cemetery in Port Au Prince, I knew the climax of the book had to be set there. Here are some pictures of places I visited that I have incorporated into the new book. As a little girl, I ran off the bus, through the driveway, up the stairs, and through the front door to sit in front of the television for the last fifteen minutes of Dark Shadows. Twenty, if the bus was early. I’ll pull off my coat, dump my books beside me, and get lost in the black and white story. I could feel the dark mist pouring out of the cabinet television. During commercials, my mom would let me have a treat – usually an RC (Royal Crown cola in the glass 18 oz bottle) and homemade cookies. Then she’d catch me up on what happened on the show before my arrival. What I wouldn’t have given for a DVR back then. I loved the dark Barnabas Collins, my first bad boy. Doesn’t get much badder than the local vampire. But Barnabas only fed when he had to. And he truly loved Victoria. Dark gothic soap opera. Watching that show was probably the start of my writing career. My wanting to write the happy-ever-after that Barnabas craved but knew he could never have. So it didn’t surprise me that my first completed (and now under the bed) book I wrote was a romance. The first book I sold was also a romance –The Bull Rider’s Brother released in June 2012. Then I sold a witchcraft novella. 2012-2013 was all about the love for me. At least in the books I released. 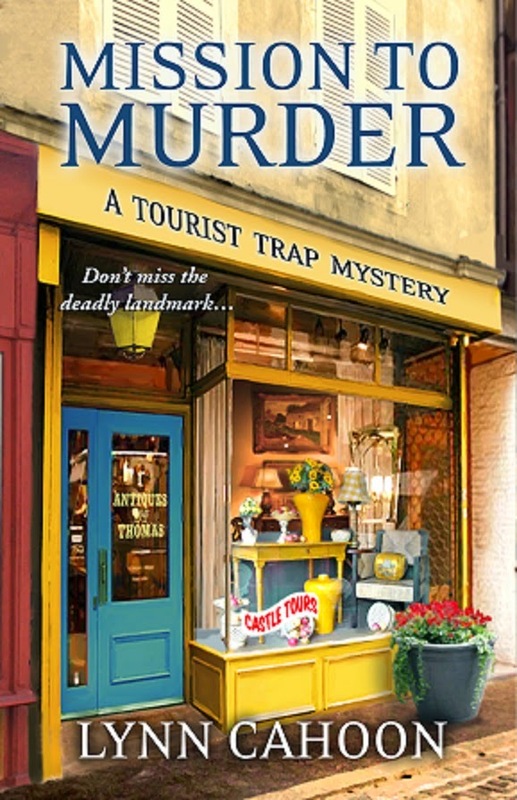 In 2013 I sold Guidebook to Murder, the first book in The Tourist Trap Mysteries. I’m releasing the second book, Mission to Murder this month. And a third in late autumn. So my writing this last couple years has focused on setting the clues and not outing the bad guy too soon. Yep, I’m fun at parties. Adding a dead body into the story adds instant conflict. And if my heroine just happens to be in the wrong place at the wrong time, so much more the fun. Don’t get me wrong. I love writing romance. Helping characters fine their soul mate one book at a time is a great job. Writing romance reminds me that me that love does conquer all barriers, even between a vampire and his dinner. Writing mysteries reminds me that good can overcome evil. Actually good must conquer evil in my view. I’m not a fan of the slasher movie types. The ones where the villain gets up and walks away after the heroine has spent the last two hours figuring out a way to win. Jamie Lee Curtis deserved better in Halloween. She worked hard to defeat Michael Myers, he should have stayed dead. You can argue the point, but I know I’m right on this. At least in Lynn’s world view. Stories set in small town America allows me to build a community of people who care about each other. People who have their own quirks and insecurities. Sometimes these insecurities make them doubt each other. Sometimes they bring people together. And book after book, the characters grow on me, their creator, to the point three books later, I’m not sure who’s doing the story telling, me or them. I grew up in a small town. The bus I rode home took forty-five minutes to deliver me back to the farm house where we lived eight miles out. Living in the country as a kid was hard. The friends I made were unusually in books. I planned to live and work in the biggest big city I could think of – New York City. From a farm south of Nampa, Idaho, I dreamed of taking my own bite out of the Big Apple. Yep, I would have fit in with the Glee kids. Except for the amazing vocal and acting talent. Instead, I stayed close to home and currently, live in a small historic town on the banks of the Mississippi river. Not a small apartment in a big city high rise. I have a two story with a back yard that backs up to a wooded area, perfect for hiding bodies. Or at least the bones my Pomeranians like to bury there. Small town settings bring my stories to life. And my villains stay defeated. And sometimes, love blossoms between a couple characters. I think Barnabas would be proud. 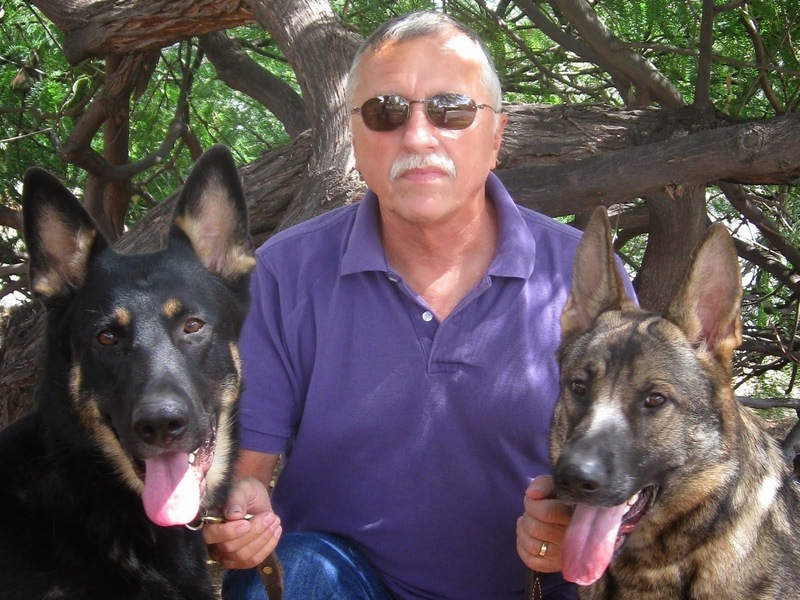 USA Today and New York Times best-selling author, Lynn Cahoon is an Idaho native. If you’d visit the town where she grew up, you’d understand why her mysteries and romance novels focus around the depth and experience of small town life. Currently, she’s living in a small historic town on the banks of the Mississippi river where her imagination tends to wander. She lives with her husband and four fur babies. I am stuck. I am profoundly, officially, ripping out hair stuck. All week, I've been multitasking. Last night I had dinner with a friend and we brainstormed a short story I've been asked to write for a unique anthology (more about that later). Earlier in the day and the day before, I did some research on topics that I might write about related to funerals and crime. The victim in my next book is a funeral director, and I have been thinking about marketing. On Wednesday, I spent a lot of the day reading a dissertation about honor and masculinity in 19th century literature. I learned why Alexander Hamilton fought a duel he didn't want to fight -- or, at least, the author's well-reasoned theory about that. On Tuesday, having started Monday with confidence, I was sure that this week I would finally have a breakthrough. I thought I would finally -- at long last -- settle on the title for the book I'm writing about dress and appearance in American crime and justice. I thought I would settle on a title and finally be able to finish writing the proposal that my agent is waiting for and that I have been working on for months. I was wrong. It may seem unimportant that I can't choose among the list of titles that I have in my notebook and on my computer. After all, chances are that if the book is sold, the title will be changed anyway. But, as I may have mentioned here, I have a thing about titles. I can't write -- or write well -- until I have one that captures what the book is about. So I wait for the right title and it usually comes. The title for my 1939 historical thriller came from the mouth of Opie Taylor while I was half-listening to a re-run of The Andy Griffith Show. When I heard it, I knew that although it seemed to have nothing at all to do with my story, it was actually a perfect metaphor for what I was trying to say about the old and the new. But nothing like that has happened with my clothing and crime book. I've read poems, looked up quotes, tried variations. One moment I think I have it and the next I don't. I have arrived at a state of anxiety that makes me think it would be easier to write the book than finish this proposal. But, of course, I need the title before I can finish the book. I have titles for individual chapters. I've done work on those. But I can't pull it all together and say what it means until I have the book title. I woke up this morning, knowing the title I came up with before bed last night still wasn't right. Rather than scream, I decided to analyze the situation. That was when I realized that by trying to power through this, I am only making matters worse. As we have all occasionally noted here, sometimes the only sensible thing to do is remove your fingers from the keyboard and step away from the computer. This is confirmed by research on the value of not concentrating. Concentrating too hard on the task at hand can be counterproductive. In an article in New Scientist (6/16/2012), Richard Fisher writes about the value of daydreaming. Humans, as a group, have a hard time staying focused. Even when we try to pay attention, our minds drift. The good news about this, is that we often get some of best ideas when we are daydreaming. The corollary of this finding is that if we are faced with a difficult task that seems to require concentration, this is often the best time to disengage -- to, as Fisher suggest, watch a Robin Williams stand-up routine -- and relax. Rather than try to work when our minds are sharp, if the task requires creativity, we might do better to work when our minds are groggy. Writers often talk about getting their best ideas in the shower. There seems to be some science related to this. S. Kay Murphy (The Writer, March 2005) discusses the value of turning up the volume on some kinds of sounds. It seems that what taking a shower or sitting within hearing of a refrigerator or clothes dryer have in common is that both the water and the home appliances produce "white noise" that block other more distracting sounds (such as a barking dog). With the distracting sounds muted, we are more relaxed and the ideas comes. I am now stepping away from my keyboard. I'm going to go drop by my office to check in with the IT person who happily will have my office computer today. Then I'm going to go see Dawn of the Planet of the Apes. After that I'm going to have an ice cream cone. And maybe go for a walk in the park and spend some time sitting by the lake. I am taking a mental health day because my poor little brain needs the rest. I, Donis, am working on a new book right now, and am very interested to see how it's going to turn out. I never know what the entire story will be before I begin. I learned early on that you may think you have it all figured out, but you don't. However, in all my previous mysteries, I at least had a murder in mind before I actually began writing. I knew who was going to meet his or her doom and how, where the body was going to be discovered and by whom. I usually knew who did the deed, though I'm flexible about that. Before I start, I always think I know why the killer did it, but to date, by the time I reach the end I discover I was wrong. The motive seems get modified every time. Thus far I have written about 135 pages for the nascent Book Eight. I know which characters will be involved, I know where the story will be set, what the season will be, what historic events will unfold, what the side stories will be. But I haven't yet discovered a body! A murder mystery isn't really about the murder, of course. It's about the mystery. But without a murder, or some other incredibly compelling reason for your protagonist to get involved, it's mighty hard to create the mystery. Not long ago, I told someone she should "trust the process" with her writing. Even if you don't know where the story is going to go, just start writing and trust that all will become clear as you go along. Have faith that the answer will reveal itself in time. I should pay attention to myself. My Alafair Tucker series started in 1912 and has moved forward years or months with each book. Book Eight has finally reached the spring of 1917, and World War I. I've done tremendous amounts of research. For each of my books, I keep a notebook and file full of information that I read up on as I need it. I’m maybe one-third of the way into this new book, and just before I sat down to write this entry, I was perusing the file, and was interested to see how much information I’ve collected about the American home front during WWI. Much of my research won't be used, for as a book advances, some of the ideas I started out with fall by the wayside. As I write on, brilliant new ideas for advancing the story will occur to me, and I’ll find myself looking up things I never would have thought of, otherwise. Is this a "writing process"? I don’t know. Ideas come to me from the oddest places–from something I’ve read, or some off-hand comment someone says within earshot of me (be careful what you say around a writer). Once or twice from a dream I’ve had. In any event, the idea gets in my head one way or another and wiggles around in there for a while. Eventually it begins to take shape and I think, “That might make a good story.” I choose a narrow time period, such as April of 1917, and start reading the April 1917 newspapers from anywhere in eastern Oklahoma to see what was going on in the world and what Oklahomans were thinking about it. This usually adds layers of story to my basic idea. Then I ponder some more, make a few notes, and then start writing. Where the story ends up is as big a surprise to me as to anyone. It usually turns out better than I had planned, so thus far I have no reason to complain. Barbara here. I know I have talked before about the joys of armchair travelling while researching a book, but every day I discover new horizons and ideas that make the writing life so exciting. Writers don't need to be limited to writing what they know; we can research what we need to know, and in the process we expand our experiences. I am currently working on a new book that combines several areas that are new and interesting to me. 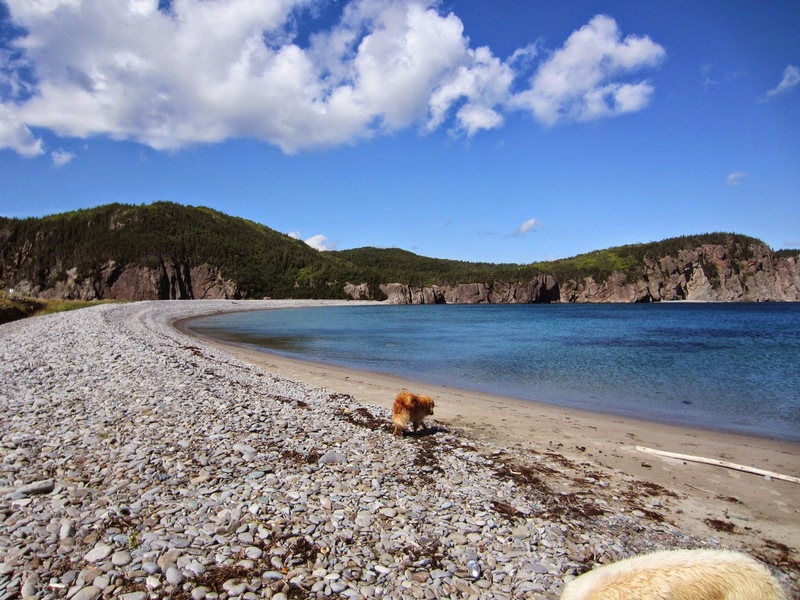 First, since the novel involves travel to Gros Morne Park and western Newfoundland, I am having a great time studying maps, pictures, and stories about the area. I will be travelling in person to the area later in the summer. And then during the dark, cold days of winter I will be researching international aid work, particularly in Africa. But right now, I am immersed in the world of motorcycles. To date, my experience of them is limited to having dated a young man with a motorcycle almost half a century ago. You never really forget the sensation of the wind tearing through your hair, the roar of the engine, the vibrations of the bike and the road, and the feeling of vulnerability along beside much larger cars. But I have never driven one, nor taken one on a road trip with all my gear stashed on the back. So far I have browsed through internet forums and motorcycle websites, and then spend an afternoon in Powersports here in Ottawa amid a whole floor of shiny new machines, talking to a young man about the kind of bike that a small woman with a dog might buy to tour from Quebec to Newfoundland. Dogs, I've learned, can be great travelling companions and can be transported in a pet carrier on the back of the bike or in a trailer or sidecar. They need to be securely belted in and should wear protection such as goggles. At the moment I have opted for a sidecar, but will be doing more research. I think the image of my character driving side by side with her 40-pound dog in a mini sidecar wearing matching goggles is perfect. But I'd love to hear from readers on the pros and cons of each kind. Meanwhile I look at every motorcycle on the road and watch what the drivers wear, how they move, how they carry their gear, as well as the kind of bikes they drive. Never having had the least interest in them before, I am now learning all I can. I look forward to my trip to Newfoundland, where I expect to meet many more cruising motorcyclists whose brains I can pick. With any luck, I will be able to bum a few rides on the open road to capture the true feeling. When a writer ventures into a domain about which we know nothing, it's crucial to get as much information as possible, not just the facts but the sensations, sounds, feelings and emotions that accompany it. Because some reader, somewhere, will be able to spot the errors and feel cheated about the whole story. PD James, for example, apparently made a mistake involving a motorcycle, and received lots of mail correcting her. What a gift to have an excuse to explore the unknown and experience new thrills, all in the name of writing research. So if you see me streaking down the Queensway on the back of a lime green motorcycle, with a dog in a sidecar wearing matching goggles, know that it will all turn up in a book sometime. Having been an active musician for the vast majority of my life, I have often lived with moments of great doubt. I’ve known nearly since the beginning that no, I am not the second coming of Mozart. In fact I’m not even musically skilled enough to have qualified for being his porter. Every time I pick up an instrument, I’m aware that no matter how much time I put in in the practice room, I will never be as good as so many people I admire. The most sobering thing is to subjectively listen to something I’ve recorded. All I can hear is the holes, the duff notes, the place where I could have done better. This is part and partial of being a (mortal) musician. We always strive for perfection. Many of us never attain that lofty level. In fact, I’ll bet if you were to talk to Mozart himself (or anyone in the pantheon of immortal musicians), you’d never have someone tell you they ever played anything absolutely perfectly. So when I listen to myself making music with feet of clay, I now shrug and promise myself that next time I’ll do better. This isn’t to say I don’t try my hardest every note I play. I’ve just come to realize that I will never obtain the true grace of perfection. Of course this semi-negative – but wholly realistic – attitude permeates my writing. I always feel a sentence or a phrase could somehow be better if I only worked harder on it, dug a little bit deeper. I learned early on that this is the best route to complete stasis. Writing is a series of choices. The longer the writing, the more choices that must be made. Every phrase is a choice. I will make good ones, bad ones, even cringeworthy ones. And there will be the occasional brilliant one. As with music, there will be authors I’ll read whose prose leaves me shaking my head, knowing I will never be that brilliant, that adept. Shakespeare can make me feel as if my brain is going to explode. He’s able to reach through the years and grab hold of you in a way no other writer can. It’s bittersweet, but I fully understand my place in the musical and literary firmament. I can only hope to entertain, enlighten a bit, and occasionally (very occasionally) reach out and grab someone emotionally. It’s the best I can hope for and I have learned to accept it. All that being said, my forthcoming Roses for a Diva is the best frigging new novel you’ll ever read by me this fall! Sorry, I never said that I was humble, now, did I? This year, though, it is shining and even if 76F isn't 112F, the way it is at Donis's place in Phoenix, that seems pretty balmy to us. Happy faces all round. The only problem is that in the other half of my life, the one I live in sitting down at my desk, the sun isn't shining. It's a slow, reluctant spring with storms and torrential downpours and it's dark at about six o'clock, not light until nearly eleven. The kind of books I write, with a countryside setting, rely a lot on weather for atmosphere and of course I can check what time it got dark in February even if I can't remember exactly. The danger doesn't come when I'm aware of setting a scene, it comes when I'm at ease with the book, absorbed in it and I suppose living it, really. And I look out of the window and it's a sunny day and the birds are singing, and that somehow that sneaks into the story. The birds don't sing much in February — hardly at all, in fact. There's a danger of roses round the door, too, at a time when they are no more than pruned stumps. I spend a lot of time Googling 'plants blooming in Galloway in March' since, no being a gardener I can never remember whether the daffodils come before the bluebells or vice versa. It works the other way round too. If I'm absorbed in my storms and tempests it comes as a bit of a shock when I emerge, blinking, to find that it was a nice day after all. I've never managed to write a book in such a way that its seasons and mine coincide but it would certainly make life a lot easier if I could. This weekend Type M welcomes guest blogger J.M Hayes, author of the wonderful Mad Dog and Englishman series, whose soon-to-be-released novel, The Spirit and the Skull, represents a fascinating new direction in his writing. Welcome, Mike! I once spent a summer doing archaeology on the North Slope of Alaska's Brooks Range. We searched for hard evidence of early immigrants into the Americas. We set up camp on a ridge overlooking a stream unnamed on USGS maps. Our principal investigator called it Sedna Creek, after the Eskimo goddess of the animals. We collected heavily patinaed primitive tools made by worshipers of a much earlier version of the Earth Mother, or so we believed. Permafrost made it impossible to prove their exact age, but we returned with a segment of mammoth tusk, the tip of which had been cut off by humans. We recovered a mammoth tooth from the same spot. The tundra is a harsh and beautiful place—one of the last true pieces of raw wilderness. Rolling sedge grassland filled with mountains, rugged ridges, lakes, streams, and rivers stretches beyond horizons. Empty of game one day, it filled with caribou, moose, elk, dall sheep, wolves, wolverines, grizzly bear and millions of mosquitoes the next. I wanted to write about the tundra for years. I finally realized the correct method was to tell the story of the people who crossed it so long ago. 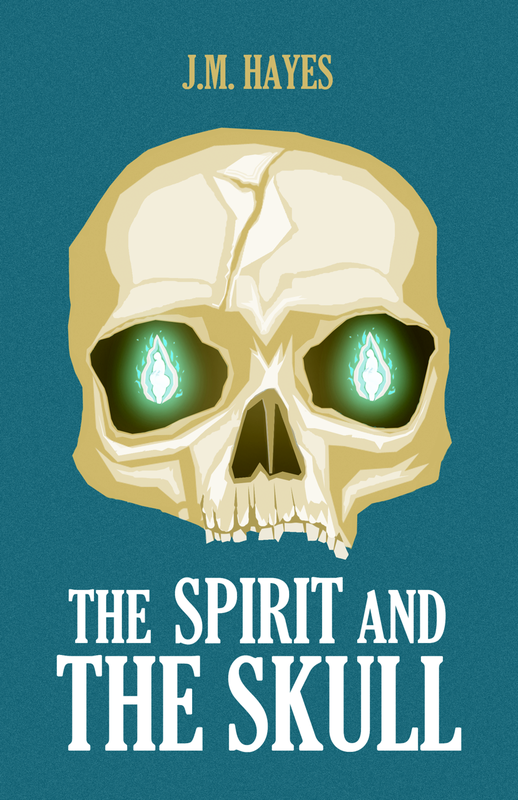 That's what my newest novel, The Spirit and the Skull, sets out to do. Murder would have been unthinkable to those early migrants, so how would they have dealt with the ultimate crime? Who might be required to solve it? How would their relationship with the tundra and its spirits affect the result? Spirits, what spirits? Am I speaking of supernatural forces or something more concrete? After a summer at Sedna Creek, I discovered the answers aren't simple. From the beginning we sensed the strangeness of the place. The tundra didn't care whether we represented science. It threw its wildness at us as soon as we unloaded our float plane and watched it leave—our last contact with the world we understood. The May Lake bowl, where we'd landed, turned gloomy as dark clouds and high hills to the north left us in seemingly perpetual dusk. The odd light helped put us face-to-face with a grizzly bear, establishing an enduring sense that anything might be possible there. Caribou in flowing massive herds reinforced a sense of otherness. 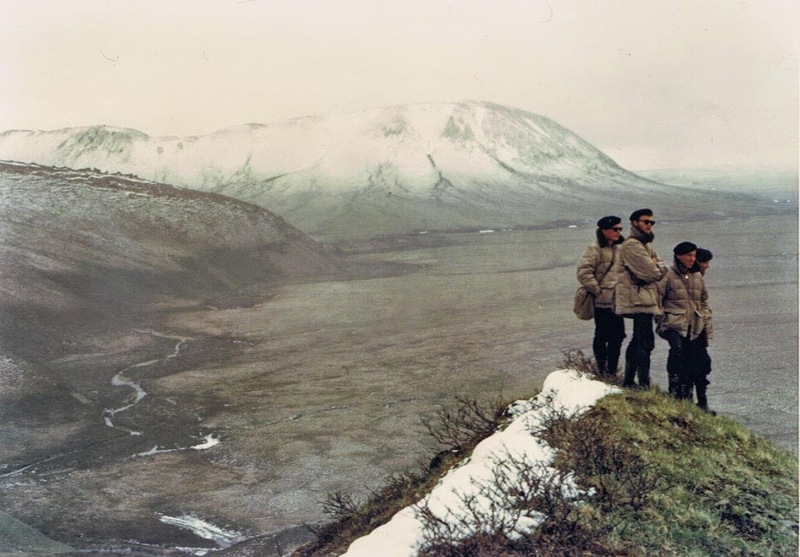 We felt as if we could climb a ridge and discover mammoths grazing beside a stream as ancient big-game hunters silently stalked them. The weather demonstrated nature's indifference. We recorded temperatures ranging from 94 to 9 degrees Fahrenheit. It rained two days out of three and snowed weekly. And the fog . . . . It hung in silence, hiding familiar landmarks. But its silence wasn't absolute. We heard voices. More than 40 miles from the nearest habitation, an Eskimo village, we heard people speaking in the fog. When night returned with a few hours of darkness, we watched the aurora's veils dance across the sky south of us. And saw a strange beam of green light, bright as any laser, reach from the uninhabited Brooks Range into space. What was that about? One of our members, while hiking Sedna Creek, looked up and saw a woman dressed in skins and furs. Impossible! When he shook his head and looked again, she was gone. But since this was Sedna's stream, seeing the goddess, if that's who she was, didn't seem inappropriate or unlikely. Evidence of Arctic Hysteria? We never feared the place. We felt blessed by it. I hope I've conveyed an accurate sense of the land and its spirits in my new novel. The place defies civilization's expectations, and will continue to do so even as we try to tame it. An editor once told me one of things they worried about at every writing conference was underestimating the abilities of someone who really didn't look like their notion of a writer. Someone with a bad perm, wearing old sneakers, stained polyester pants and an old T-shirt. This happened to her once. And she never forgot it. Because the lady turned out to be one of the most successful romance writers ever. By dissing her the editor lost a lot of credibility with her publishers. That comment has stayed with me because writer's conference are by nature--well, exhausting. They just are. I can just imagine an editor spending an entire afternoon listening to pitches and having someone show up announcing they have written a book about vampires. Does that sound promising? Probably not. It's been done for goodness sake. I just read a fascinating novel, The Quick, that is another unique book involving vampires. One of my favorite books was The Historian by Elizabeth Kostova. Our own Type M'er, Mario Acevedo, has a vampire series. A student of mine at Fort Hays, Morgan Chalfant, wrote a vampire western, Youngbloods. Steven King's Salem's Lot isn't at all like Anne Rice's The Vampire Chronicles. So what is it about vampires that inspires writers to come up with books so different from one another? What is there in the human psyche that connects to such a bizarre creature. I'm not only speaking of writers, but the readers who devour them. No pun intended. I really am not enthusiastic about vampire books, nor am I inclined to believe a word. And yet, and yet. When I first read Salem's Lot wore a crucifix around my neck for days. I wore it when I slept too. The Historian is a terrific book. That's when I began to doubt my disbelief. I searched for vampires in Amazon before I started this post. Some of the covers were a little too interesting. You want blood? There's blood aplenty. There were over 100 pages of Vampire titles. That has to be a category record. If you are starting out in this business, don't ever let someone tell you that your book won't be published because another writer has already written a book on the same subject. John here, coming to you from Exeter, New Hampshire, where, for year number four, I’m teaching summer school — and writing. I am interested in the composition process and have often used this platform to write about, to ponder, and to ask for others’ input on subjects such as outlining vs. shooting from the hip, and other topics related to the process. This week, I finished a 7,500-word story featuring Peyton Cote, my tough-as-a-bag-of-scorpions U.S. Customs and Border Protection agent. The story is called “Guilt Riddance”, and I wrote it as a trial run: I wanted to see if the concept held up well enough to eventually be the bones of the next novel I’m contracted to write (this would be Peyton #3, 2016). I'll see what feedback I receive from my advance readers, but I think it holds up pretty well, and I plan to send it off to editors at various magazines. It was a unique composition process. I have taken a novel and boiled it down to a story once before — Bitter Crossing (Aug. 4) became “Autumn’s Crossing” (Alfred Hitchcock Mystery Magazine, 2013) — but I’ve never written a story that will serve as the outline for a future novel. All in all, I’m looking forward to seeing how it goes. And I’d love to hear from anyone who has done this before. If you’re looking for a successful example, see Ed McBain’s “Sadie When She Died”. There’s an old adage in Hollywood that, while some actors earn huge amounts of money, most actors wait tables, drive cabs or do some other menial work so they can keep body and soul together while waiting for their next acting gig to appear. The average actor’s salary in the movie biz is pathetically low. We authors are in the same boat. Most work other jobs to keep food on the table, and writing is squeezed into whatever leftover time there is. That’s a discussion that’s gone on many times here at Type M (as it has on most other writing blogs). Several things stand out to me in this article. First of all, you have to know that it’s not a British book publishing problem. It’s everywhere. Having been in the game for awhile now, I understand why so many changes have come about: margins are tighter, everything is more expensive. But what has always been the case is still ubiquitous: the creators of the content, those who are supplying the raw materials for the publishing industry to work with, are getting the shortest end of a shorter stick. Advances against royalties (borrowing against the potential success of a book as the article succinctly states) were invented as a way for writers (or any artist, really) to be able to focus solely on their writing. As advances have shrunk, the ability to put food on one’s table has to be far more in the forefront than it should be for the system to work. When having to balance writing against providing for oneself and one’s family, guess which is going to win out? At the same time, publishers have discovered that while we weep and moan about how we’re being forced to practise our craft, writers will put up with far less than they will willingly admit. We will write for nearly slave wages — if that’s all that’s being offered. The more generous publishers now generally offer advances that might pay for a couple of months off for a writer with a day gig. But when you’ve got a full-time job, how do you accomplish that? You can’t just walk into your boss’ office and announce you’re going to be away for two months. Many of us, though, put up with even less. Those advances are simply nothing more than a token amount. The worst part is that there are now publishers that want to apply royalties accruing from a successful book back onto a previous book that was less successful. Huh? So book one doesn’t sell that well – for whatever reason – but book two does. If there’s still an outstanding amount on the royalty advance for book one, the publisher will apply royalties from book two to that account until it’s paid off. Only then will the writer get any royalties from book two. In a nutshell, that stinks. We’re all in this together, aren’t we? Publishing is a gamble — for all concerned. These publishers want it all in their direction. Minimal risk for small input, chance of big rewards. Talk about hedging your bets. You’d like to think that might happen, but I know which way to bet. Two weeks ago, I promised you more photos from Nelson of the places that inspired some of the settings in the Constable Molly Smith series. Instead of putting them here, I've put them up on my own blog, One Woman Crime Wave (http://klondikeandtrafalgar.blogspot.com). Instead, I want to take this opportunity to introduce you to the Crime Writers of Canada, if you don't know it already. 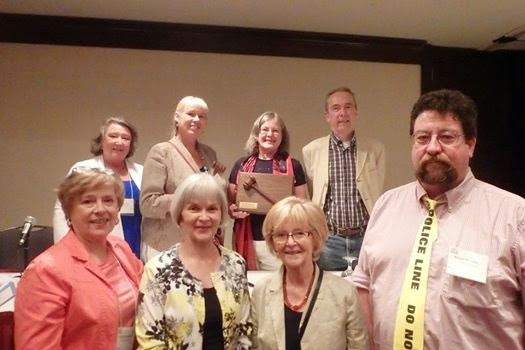 As of a couple of weeks ago I became the president of the Crime Writers of Canada. The post was not entirely a surprise, as I was the National Vice-Prez before that. Still, I am now slowly getting into my new role. Let me introduce the CWC to those of you who might not be familiar with it. As its name suggests the Crime Writers of Canada is an organization of… Canadian crime writers. No brainer there. 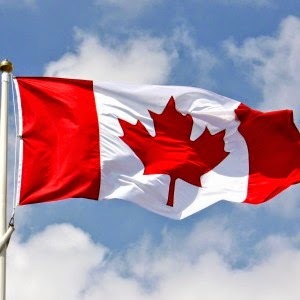 We exist to promote Canadian crime writing and Canadian crime writers not only in Canada (where, sadly, we need a lot of promotion) but around the world. The group was established in 1982 and has grown steadily to its current 300 plus . In 1994, the CWC established the Arthur Ellis Awards (AKA the Arthurs) for Excellence in Crime Writing. The Arthurs are open only to Canadian citizens and permanent residents, although the books can be published and set anywhere in the world. Or outside of it. Arthur Ellis, incidentally, was the nom de travail of Canada’s official executioner. A job that was finally eliminated in 1976. If that whets your appetite, CCC backlists are always available on the web page, (www.crimewriterscanada.com). You don’t even have to remember to look for CCC every quarter, look for the Crime Beat tab on the web page or go here: http://crimewriterscanada.com/crime-beat/about-crime-beat and click on Subscribe Now. It’s free! Want still more? Why not Like us on Facebook? Canada is a mighty big country (second largest land mass after Russia) with a relatively small population. We can’t exactly all gather at the neighbourhood pub one Sunday afternoon to talk writing. Nevertheless, one of the aims of the CWC is to encourage a spirit of cohesion and community among Canada’s crime writers. In early June, the AGM was held in Toronto. Once the exciting business of the AGM was over, we adjourned to a private suite in a hotel for a cheese and wine reception. The party was so well attended that we spilled out into the hallway. During the year the CWC takes part in many national and local initiatives, including the annual Crime Month project with the CBC Canada Writes web site, Word on the Street in many cities, provincial and national library association conferences and much more. These events give individual authors a chance to put themselves in front of the public. Even if they’re unable to attend, promotion of the CWC promotes all of our authors. So, if you are a crime writer, and you’re Canadian, why not think about joining. 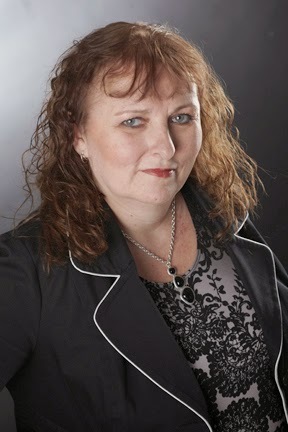 Find out more at www.crimewriterscanada.com. Here's a pic of the new board, taken at that AGM. I got the updated guest blogging schedule to the members of Type M a wee bit on the tardy side, so Aline wasn’t aware that this was her weekend for a guest. In order to rectify my error and give everyone a chuckle, and a bit of thought-provocation, I’m presenting the following. If you’re in the States, I hope you’re having a lovely long holiday weekend, and if the weather is nice where you are, enjoy the weekend! Today is the last full day of my writers retreat in Vermont. Last night, we had two hours of severe weather -- which seems to have been happening all over the Northeast. I hate storms so I retreated to my bedroom while my inn mates enjoyed a fabulous meal and a lively discussion. (However, I did not go hungry. Dinner was brought to my room). The storm knocked the power out, and so we spent the evening by candlelight and then with sporadic power provided by the generator. At some point during the night, the power came back on -- but not before I had written for about an hour of that time holding a small flashlight under my chin so that I could see the keyboard. I had just finished what I was writing when my computer battery went down. This inspiration had come from a conversation that happened at dinner after I retreated to my room. One of our hosts had asked if I had ever incorporated my fear of storms into my fiction. The answer is, yes. Lizzie Stuart, my crime historian, is not fond of storms and a couple of times this has been relevant. On the other hand, Hannah McCabe, my near-future police detective is not a wimp. Good thing, because she's dealing with all kinds of weather as her 2020 world experiences climate change. But, as I started to say about inspiration -- after the storm, when several of us had gathered at the coffee/tea station -- someone suggested we should all write a storm-themed short story for tonight's communal sharing of our work. I don't know if everyone did when the power went down for an hour again, but the suggestion reminded me that I had an idea that I had been playing with for a while for a Lizzie story. That was how I came to pound out several pages in the dark with a flashlight under my chin. I should say this urge to write came after I'd spent the day writing and re-writing the three and a half page first chapter of my 1939 historical thriller. I shared the synopsis and outline during our after dinner readings on Wednesday evening, and buoyed by the feedback I'd gotten about my plot (complex, but made sense), I was ready to plunge in. Or, at least, I was after I fell asleep and woke up yesterday morning knowing something about my protagonist that gave me the first two paragraphs of the first chapter. I also knew -- a question I had been asked during the plot discussion -- what forces would be driving him to get involved in a pursuit that could cost him everything. Of course, the flip side of that question was what forces might make him initially reluctant. It turns out what I came up with in my sleep should also handicap him as he goes up against a villain who is willing to do what is required to carry out his plan. Aside from fiction writing, I've gotten some work done on the proposal for my non-fiction book about clothing, appearance and crime. I discovered it wasn't really a good retreat project because I couldn't finish the chapters away from my office -- even though I brought along two boxes of articles and another of books. But I did get the proposal itself sketched out and I outlined the chapters. One of the best parts of the retreat has been sharing time with a congenial group of writers. Although we are writing everything from memoir to literary fantasy, we've discovered that we blend easily and are able to offer useful feedback. It's been a week well spent. I hope I can carry this creative energy home with me tomorrow. P.S. Sorry not to include photos. I intended to get them last evening, but then the storm came. 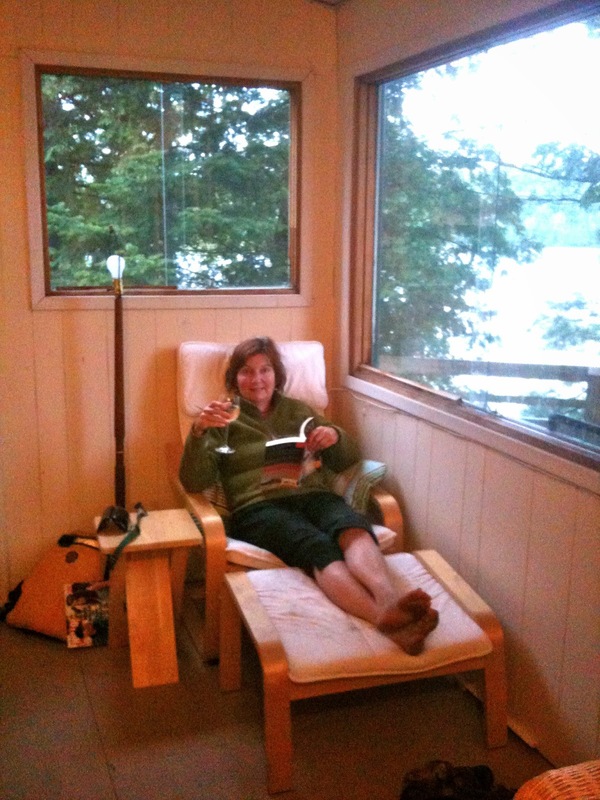 I, Donis, wish I were lounging next to the lake, watching baby loons along with Barbara (previous entry). But, alas, no. It's summer in Phoenix and there is no lounging to be had. It is hot hot hot. The thermometer on my back porch currently registers 110º, heading for a high of 112º according to the local weathercast. No one wants to spend time outdoors. Not humans, pets, or pests. It's time for the ant wars. In the early Twentieth Century time period I write about, what we now think of as strictly food was often used for lots of things other than eating--cream to soothe a sunburn, a strawberry mask for refining the skin, lemon and beeswax to polish furniture, milk to lift stains, black pepper to keep cats out of the garden. Folks knew how to take care of problems without resorting to Max Factor or Weed-B-Gon. Or Truly Nolan. We've been visited lately by ants in the kitchen, which has afforded me the opportunity to conduct my own field research in natural pest control. This happens about once a year. They come in around the kitchen window, tiny Houdinis who find openings no matter how many times we re-caulk. Most of the time we live in cautious harmony, the ants and I. If they don't bother us, we don't bother them. There have been a couple of times when a large anthill appeared in the back that was too bothersome to ignore, and Don got rid of them by flooding them, then dumping blended-up oranges, peel and all, into the hold. Did we destroy the den? I doubt it, but he did persuade the colony to relocate, at least, for we never saw that particular group again. After consulting the 1879 edition of The White House Cookbook, and the 1878 edition of Housekeeping in Old Virginia, we began by laying down a line of baking soda across the window sill. It looked rather like a dusting of snow, and the ants decided to go skiing. No good. I followed that up with a line of cinnamon, which worked like gangbusters. The ants absolutely refused to cross the line, and the cinnamon had the added benefit of making our kitchen smell like Christmas. 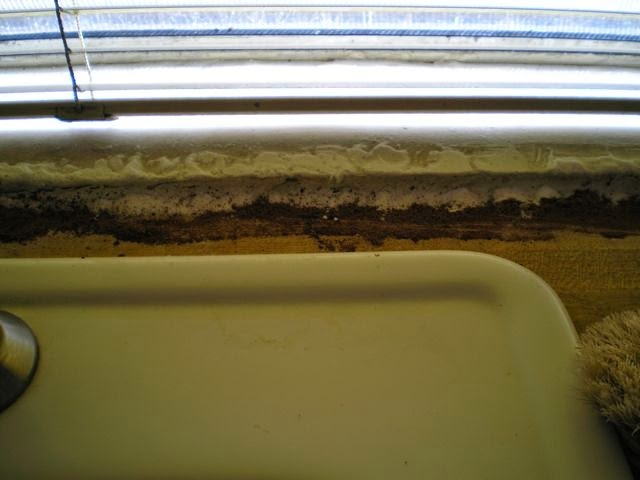 However, have a look at the photo and tell me if you want your kitchen window to look like this. Besides, the ants solved their problem by walking up the wall and crossing into the kitchen above the line. Dang. Since pungent smells are apparently the answer, Don saturated a cotton ball with eucalyptus oil and rubbed it up and down the window sill. This worked for a while, but the smell fades and ants are patient. So he saturated several more balls, some with eucalyptus, some with rosemary oil, and some with lemon oil, and stuffed the balls themselves in the corners where the window pane joins the wall. It's been a week, and no ants. One task left before the annual re-caulking party is to wash down the wall outside under the kitchen window with a bleach water solution to get rid of their chemical trail. We hope. It's worked before. Barbara here, still recovering from the hilarious video Rick posted yesterday in honour of Canada Day. It's hotter than Hades up in the True North Strong and Free at the moment, but this being Canada, we relish this incandescent, all too brief flare of summer. We pour out into the countryside in long processions of cars with boats, canoes or tent trailers in tow. Some of us lucky ones visit cottages, especially in Quebec and Ontario, where lakes and loons are everywhere. Summer invites adventure, togetherness, and leisure. It is a time to explore new challenges but also to laze under the trees or on the beach with a book in hand. As a writer, I find my pace changes in the summer. The deadlines for manuscripts, blogs, social media posts, or whatever may still be there, but they recede in importance as possibilities and distractions stretch out before me. 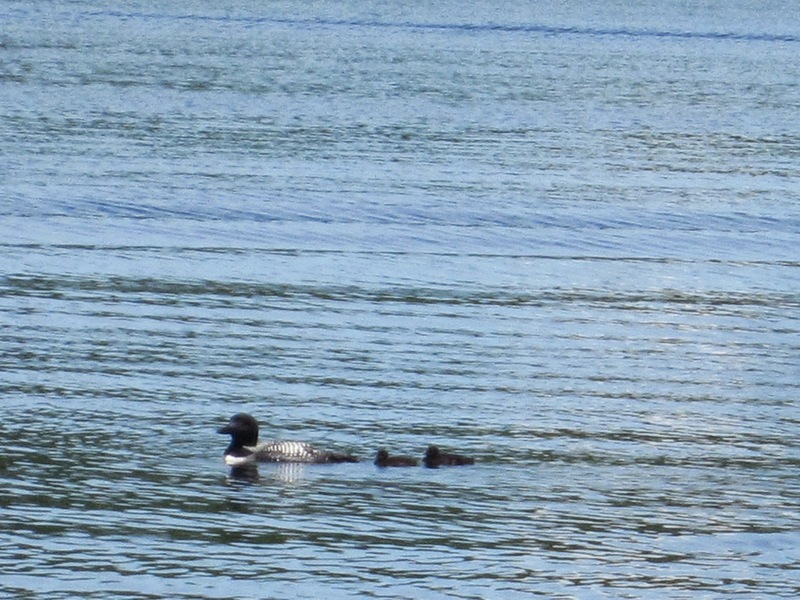 I try to discipline myself to write at least one scene every morning, but I find myself sitting on the dock at my cottage, listening to the birds and watching the baby loons while my pen slips lazily from my hand. I should also add that I have an exuberant Nova Scotia duck tolling retriever who thinks that lake plus ball is one big party time. Summer is also the season when we reconnect with far-flung family and friends after months of hibernation. Another distraction from the focussed, solitary task of writing! But one of the truly wonderful things – perhaps the most wonderful thing– about being a writer is the community of friends we make. We inspire, encourage and nourish each other, not to mention we share wisdom about the business end of writing. Generally not where our talents and interests lie. My friends and I have discovered that one of the ways to have our cake and eat it too, or rather to write and party too, is to hold "writers' retreats" at one of our cottages or homes. We have actually held these in all seasons; sitting on the dock at someone's waterfront cottage, or walking through the autumn leaves in another friend's wilderness cabin, or snuggling around the fire in a century-old farmhouse while the snow falls outside. The group varies, depending on who is available and interested (and how many spare beds there are). Sometimes we are three, other times four, even six. I am looking forward to just such a retreat this weekend, at my own cottage. There is always lots of wine, good food, gossip, and laughter. All three of us have writing projects on the go, all have deadlines, self-imposed or contractual. We have promised ourselves that there will be writing every day. We will disperse to a quiet room or deckchair to be alone with our muse for at least a couple of hours before we break out the party and gossip hats. At least that's the plan. Until the baby loons drift by. Up here in Canada, it’s our national holiday, Canada Day. Clever name, eh? Canadians say “eh” a lot. It’s the equivalent of Americans saying “huh”. There are a lot of other things Canucks do differently than their close cousins south of the border. Well, yes and no. There are a lot of differences. Problem is, you have to learn to distinguish between the sheep. First and foremost, Canada didn’t separate from the motherland (England) and that is probably the heart of the matter. Up here, those who didn’t support the US revolution and moved to what was then called Upper and Lower Canada (now Ontario and Quebec with the Maritime provinces) are called Loyalists. Down south they were “Tories” at best, and “traitors” at worst. We still have a Queen. I spend a lot of time trying to explain Canada to my American friends and relatives when we return “home” for a visit. It’s tough. Canadians around the world, but especially in the US are viewed as polite and a bit boring. There was an exclusive private school in Europe for the children of diplomats. In one class, there were four students: one from England, one from France, one from the US and one from Canada. Their teacher asked them to write an essay on elephants. The next day, the students read their essays aloud in class. The British student went first. He wrote an essay called “Elephants and the Foundations of the British Empire”. Then the French student read his, “Elephants and Love”. The American student went next. His essay was “Building Bigger and Better Elephants”. So now you know. Happy Canada Day! And to add to the Canadianfulness, here’s a great Canadian commercial for our special day.